The Tampa Bay Rays head to Oriole Park on Saturday, September 23, 2017 to take on the Baltimore Orioles. The expected starting pitchers are Jake Odorizzi for the Rays and Jeremy Hellickson for the Orioles. The odds for this matchup have Tampa Bay at +103 and Baltimore at -113. The Rays have a 74-76-3 over/under mark and a 72-81-0 run line record. 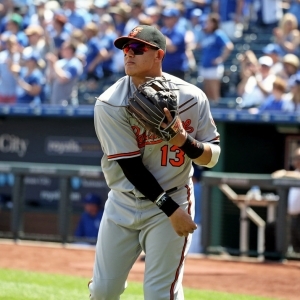 The Orioles are 71-83-0 against the run line and have a 76-74-4 over/under record. The Rays have a 74-79 overall record this season. Starting pitcher Jake Odorizzi has a 9-8 record with an earned run average of 4.46 and a WHIP of 1.28. He has 114 strikeouts over his 133.1 innings pitched and he's given up 112 hits. He allows 7.6 hits per 9 innings and he has a FIP of 5.72. The bullpen has an earned run average of 3.77 and they have given up 445 base hits on the year. Teams are hitting .230 against the bullpen and they've struck out 463 hitters and walked 190 batters. As a team, Tampa Bay allows 8.2 hits per nine innings while striking out 8.3 batters per nine innings. They are 8th in the league in team earned run average at 3.96. The Rays pitchers collectively have given up 1,248 base hits and 602 earned runs. They have allowed 182 home runs this season, ranking them 19th in the league. Tampa Bay as a pitching staff has walked 476 batters and struck out 1,260. They have walked 3.1 men per 9 innings while striking out 8.3 per 9. They have a team WHIP of 1.26 and their FIP as a unit is 4.19. As a team Tampa Bay is hitting .243, good for 27th in the league. The Rays hold a .421 team slugging percentage and an on-base percentage of .315, which is good for 23rd in baseball. They rank 26th in MLB with 8.2 hits per game. Corey Dickerson is hitting .275 with an on-base percentage of .321. He has 154 hits this season in 559 at bats with 60 runs batted in. He has a slugging percentage of .487 and an OPS+ of 117. Logan Morrison is hitting .240 this year and he has an on-base percentage of .346. He has totaled 116 hits and he has driven in 82 men in 484 at bats. His OPS+ is 130 while his slugging percentage is at .508. The Rays have 1,260 hits, including 215 doubles and 214 home runs. Tampa Bay has walked 514 times so far this season and they have struck out 1,468 times as a unit. They have left 1,055 men on base and have a team OPS of .736. They score 4.22 runs per contest and have scored a total of 645 runs this year. Baltimore has a 74-80 overall mark this year. With an earned run average of 5.47, Jeremy Hellickson has a 8-10 record and a 1.28 WHIP. He has 92 strikeouts over the 158 innings he's pitched. He's also given up 156 hits. He allows 8.9 hits per nine innings and his FIP stands at 5.81. The bullpen has an earned run average of 3.84 and they have given up 534 base hits on the year. Teams are hitting .248 against the Orioles bullpen. Their relievers have struck out 480 batters and walked 214 opposing hitters. As a team, Baltimore allows 9.3 hits per nine innings while striking out 7.7 batters per nine innings. They are 27th in the league in team earned run average at 4.87. The Orioles pitchers as a team have surrendered 1,424 base knocks and 744 earned runs this season. They have given up 228 home runs this year, which ranks 3rd in Major League Baseball. Baltimore as a staff has walked 555 hitters and struck out 1,173 batters. They give up a walk 3.6 times per 9 innings while they strike out 7.7 per 9. Their team WHIP is 1.44 while their FIP as a staff is 4.94. As a team, they are batting .261, good for 8th in the league. The Orioles hold a .441 team slugging percentage and an on-base percentage of .313, which is good for 26th in baseball. They rank 4th in MLB with 9.1 hits per contest. Adam Jones comes into this matchup batting .282 with an OBP of .319. He has 165 hits this year along with 71 RBI in 586 AB's. He maintains a slugging percentage of .464 with an OPS+ of 108. Jonathan Schoop is hitting .295 this season and he has an OBP of .340. He has collected 174 hits in 590 at bats while driving in 105 runs. He has an OPS+ of 126 and a slugging percentage of .514. The Orioles as a unit have 1,405 base hits, including 257 doubles and 228 homers. Baltimore has walked 378 times this year and they have struck out on 1,326 occasions. They have had 991 men left on base and have an OPS of .754. They have scored 4.66 runs per game and totaled 718 runs this season. Who will win tonight's Rays/Orioles MLB game against the spread?